A good shot of the racket head and forearm just PRIOR to pronation. 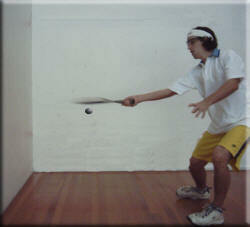 A number of biomechanical processes occur when hitting a Squash ball. One of these is the one where much of the power in the shot is generated - the rotation of the forearm. Known technically as "Pronation" (for the forehand stroke) and "Supination" (for the backhand stroke) they represent the final surge of acceleration for a Squash shot, especially the drive. For the professionals, this rotation is more of a "snap" of the forearm which is the reason they seem to generate power so easily. Unfortunately this rotation is a double edge sword. While it can help you generate power, it can also generate mistakes. For the professionals, they invariably start with a very open face racket, but for many club players their swing starts with a closed face. The rotation of the racket tends to close the face of the racket so by starting off closed you tend to close the face even more thus sending the ball where you don't want it to go - into the TIN. To make pronantion/supination/rotation work for you, start the racket preparation with an open face, (like the pro's). You can make sure this happens (on the backswing) by ensuring the palm of your hand is facing upwards on the forehand and downwards on the backhand. As the downswing for the drive comes into the contact zone, rotate the forearm so that the racket heads starts travelling through the ball towards the target point.